Last month I reviewed the background and history of the CWPI index based on the monthly survey of purchasing managers. I was a bit concerned that this index might continue to decline. 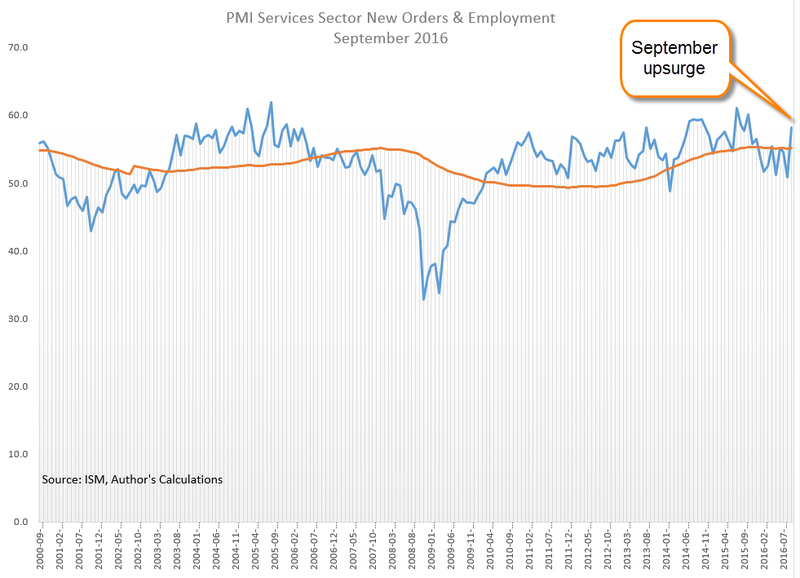 Instead it showed a big upsurge in new orders and employment in the service sectors, sending an index of these two components above its five year average. This may be a sign of a third quarter rebound after a lackluster first half of the year. 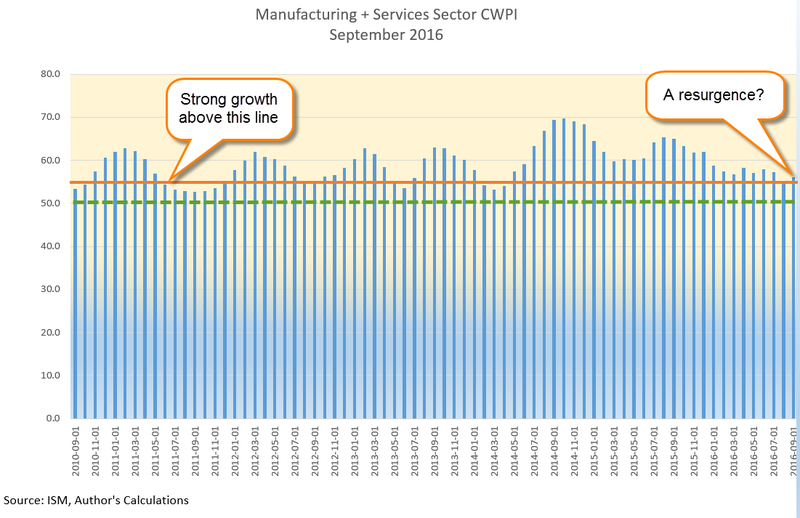 September’s stronger manufacturing survey lifted its index from the contractionary reading of the previous month. The CWPI composite of the manufacturing and non-manufacturing surveys is a smoothed average to dampen any month-to-month erraticness and give a truer picture of trend. Although the CWPI indicates strong growth, this is the longest period of time since 2011 that the CWPI has registered below 60, a mark of fairly robust expansion. The height of this last wave was over a year ago, in August 2015. The downward trend is stil in place but this month’s survey gives some hope of a turnaround. A Pew analysis of Census Bureau data shows that 18-34 year olds are living with their parents in even greater numbers – 32% – than during the Great Recession. This bests the previous record set in 1940, between the Great Depression and World War 2. In the EU, almost half of 18-34 year olds are living with their parents. In a consumer driven economy, growth depends on children moving out of their parents’ home to form new households, to buy furniture and home furnishings, to consume electricity and water, to pay property taxes and all the many expenses involved in running a household. Here is a recent paper published by the Federal Reserve. There is not much that Hillary Clinton and Donald Trump agree on. However, both candidates are calling for a big infrastructure spending program to repair roads, bridges, airports, dams, water pipes, schools, etc. The American Society of Civil Engineers has given a D+ grade to this country’s infrastructure and has estimated that $3.6 trillion of repairs are needed by 2020. $3.6 trillion is the entire Federal budget, or about $12,000 per person. It is unlikely that either candidate can get a bill through a Republican Congress. In 2011, Robert Frank, Paul Krugman and several liberal economists called for a $2 trillion infrastructure spending bill. The goverment could borrow at rock bottom interest rates, the repairs were needed and the spending would have been good for employees and businesses at a time when unemployment was 9% and real GDP had finally reached the same pre-recession level four years earlier. Citing large budget deficits and a Federal debt that had increased 50% in three years, Republicans squelched any infrastructure bill. Included in the price of each gallon of gas is a Federal excise tax that is paid into the Highway Trust Fund (HTF) to pay for repairs to the interstate highway system. The allocation of tax revenue is currently based on the amount of gallons of gasoline that each state sells but that presents another set of complications. Exclusions to the allocation computation are jet fuel, fuel used by tribal lands and a host of other exceptions that are peculiar to each state. This results in a spider’s web of adjustments to the gallons reported by each state. As you can imagine, the instructions for the adjustments are complicated. An easy formula for distributing the tax revenues to the states could be a simple one: allocate the money based on the number of miles of interstate highway in each state. But that would treat a low traffic route like U.S. 90 through Montana the same as the heavily traveled U.S. 495 running through part of New York City. One suggestion has been to count only the interstate highways that pass through more than one state, and to exclude secondary highway routes designated by a three digit number. For instance, US 495 is a route from US95 through New York City. US 635 is a highway that goes around Dallas, Texas and connects with the primary north-south highway US 35. An allocation scheme based on actual mileage driven has been proposed but would require the reporting of one’s travels to a government agency via a transponder, a step too far for many. While newer cars and many trucks already have a GPS locator in the vehicle, the logistics and cost of upgrading older commercial and passenger vehicles are daunting. Every four years we have a Presidential election, a contest to choose the next Peter Pan who will magically overcome an entrenched bureaucracy, a recalcitrant Congress and a horde of fat cat lobbyists feasting on the power and money flowing into Washington.